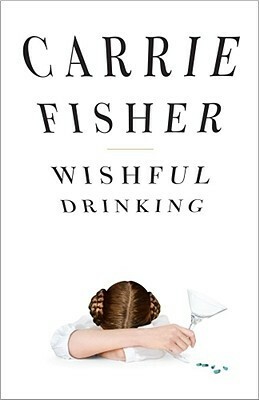 When I hit “play” on the audiobook edition of Wishful Drinking, hearing Carrie’s Fishers voice come out of my earbuds almost floored me. I knew that the audiobook was narrated by the author, but somehow I hadn’t connected that with the fact that Carrie Fisher was going to be telling me the story of her life. Just hearing that sarcastic raspy voice was enough to transport me completely. Carrie Fisher was one of my heroes when I was growing up, and not for the reasons you might think. Of course I’ve been a life-long fan of Star Wars to the point where I’m currently sipping tea out of a Death Star mug, but it wasn’t Fisher’s portrayal of Princess Leia that made me love her. It was maybe twenty years later, when I was watching an interview with Fisher on Leno or Letterman or one of those late-night talk shows. I was probably only ten years old, but I remembered even then just how few fucks Carrie Fisher gave about anyone else’s opinion of her. Her memoir, Wishful Drinking, is an extension of that attitude. Considering that the cover features Fisher dressed up as Princess Leia, I imagined that this book would be filled with fun behind-the-scenes tales from her time on the set of Star Wars. Fisher knows her audience, and does deliver some amusing anecdotes about working with George Lucas. But ultimately, Fisher did not write her memoir to talk about her career as an actress. She wants to talk about mental health. Carrie Fisher was a loud and lifelong advocate for mental health. She is open and honest about her own battles with bipolar disorder and the substance abuse problems that so often accompany the illness. She describes how electro-shock therapy has left her with holes in her memory but a renewed zest for life. This matter-of-fact portrayal of mental illness was refreshing, and Fisher herself seemed to take great comfort that so many “crazy people” managed to achieve so much despite their mental health problems. It doesn’t help that it was all read in Fisher’s brash tones. You can find Wishful Drinking here on Amazon or here on Book Depository. The Audible edition is read (wonderfully) by the author and can be found here. Caden Bosch is on a ship headed towards the Challenger Deep, the deepest point on Earth located in the Marinas Trench. Sometimes. Other times he is a fifteen-year old high school kid who is beginning to have difficulty distinguishing between what is real and what is not. Caden Bosch is elected the ship’s artist, whose job it is to document the ship’s crew with pictures. Sometimes. Other times he is a boy who cannot stop moving, who quits the track team and instead wanders for miles around his neighborhood. Caden Bosch is beginning to contemplate mutiny against the ship’s captain but is still holding on to his allegiance. Sometimes. 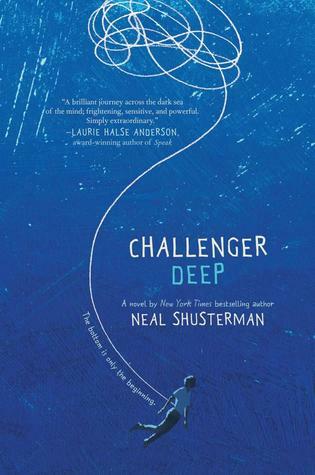 Neal Shusterman dives deep into the heart of mental illness with Challenger Deep, and explores how a person’s mind can begin to betray them. Caden Bosch is never diagnosed with anything specific, but his symptoms exhibit signs of schizophrenia or borderline personality disorder. He begins to feel constant paranoia and anxiety, and his social functions plummet as he loses the ability to hold a sustained conversation. Shusterman, who uses many personal details from the life of his own son, portrays Caden as someone who has great inner strength but finds that all the perseverance in the world cannot always combat the continuous onslaught of mental illness. Shusterman depicts the confusion that Caden feels by ensuring that his readers have some difficulty discerning exactly what is going on at any given time. His chapters are short, only three or four pages long, and vary from Caden on board a sailing ship in the middle of the Pacific to Caden trying to hold on to the pieces of his life while his illness threatens to consume him. The first fifty or so pages of Challenger Deep twist into a big jumble before settling into a more straightforward narrative. In this way Shusterman helps us to empathize with his protagonist. Challenger Deep represents a brutally honest, yet ultimately sensitive portrayal of mental illness. Caden’s struggles are never glamorized or dramatized for effect. We identify with his struggles and rejoice with his rare glimmers of hope. He understands that he will never be “cured” and instead has to come to terms with the fact that his mental illness with be with him for the rest of his life. Instead of this being a sour note, Caden is able to meet it with resignation. You can find Challenger Deep here on Amazon or here on Book Depository.